« What If North Korea Did It? When I used to teach ESL back in Vancouver, my South Korean students were fond of telling me there are three types of people in their country: men, women and ajumas. Ajuma literally means “married woman”, but my students were really talking about a specific subset of this group between roughly 45 and 65 years of age. The young people in Korean society are cowed by these women who seem able to do pretty much whatever they want. You wouldn't want to mess with this ajuma. Stories abound of how an ajuma getting on a subway train will throw her purse on an empty seat before rushing over to grab it. 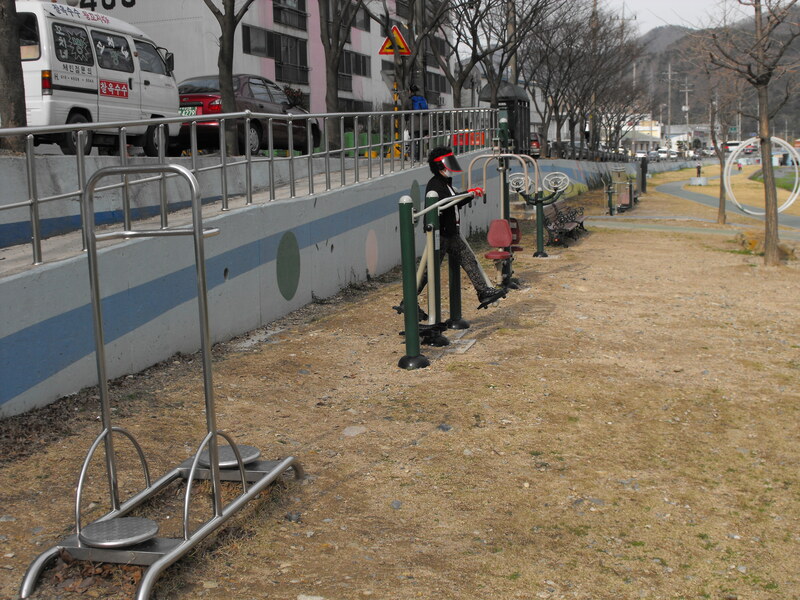 Some poor young kid who has been standing for fifteen minutes and was about to sit down can do nothing about this due to the importance of age in South Korea. Ajumas are also notorious for cutting to the front of long lines, using any and all means to get to the last item of a product on sale, and loudly discussing the bodies of young Korean women at the public baths. Ajumas are also incredibly fast. The first time I was in Korea, my wife and I had to take a long ride on the subway in Seoul. After I had been standing for about thirty minutes in the very crowded train, a young student who was sitting right in front of me got up to make his way to the door. I couldn’t wait to take a load off, but just as I began to turn around to take the newly vacant seat, some tiny little ajuma magically appeared from nowhere and took it! She was quick as lightning, and while I was irritated that I had to keep standing, I couldn’t help but be impressed. My students had told me about “ajuma power” many times, and now I knew concretely what they were talking about. In addition to their mighty power, ajumas also have a distinctive style of dress. Floral prints mixed with pastels or else a dark track suit are the two main looks. A perm is de rigueur. It starts off as a wave perm for women in the pre-ajuma power stage, gets tighter around 45 and finally progresses to a poodle-like coif later. To cap it all off, so to speak, almost all ajumas wear a visor, preferably one with a dark shade that covers almost their entire face to prevent their skin from freckling in the sun. 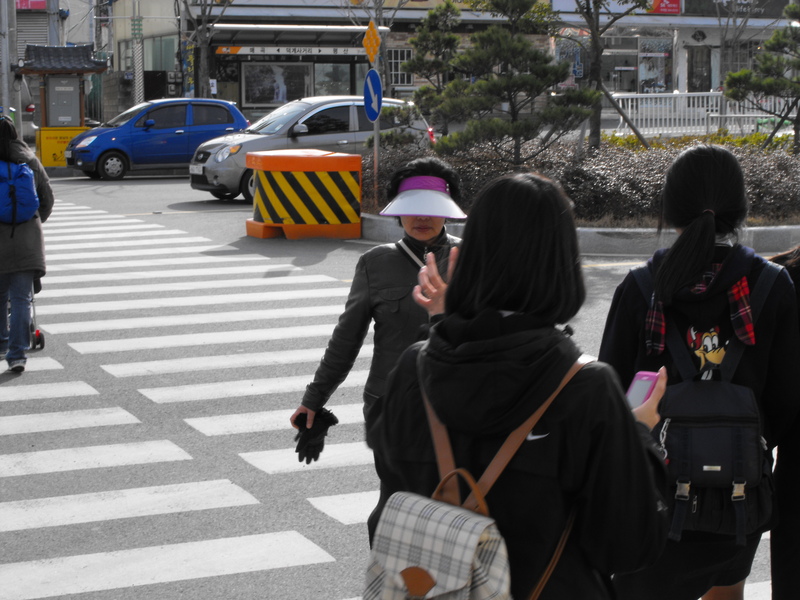 An ajuma with full visor works out. Young women put up with a lot in Korea. Growing up, they often take a backseat to their brothers – especially the eldest brother, who is basically the parents’ retirement plan. Smoking on the street is taboo for young women but not for young men. Their curfews are stricter typically. And if a Korean woman marries a first-born son, she will usually live with his family and be under her mother-in-law’s thumb. Given all this, I can understand why a woman in South Korea would let loose once she reaches a point where she is older than most and finally has some power. After basically being a second class citizen for her entire life, why not enjoy the perks once they come? This is why I don’t believe the women of my wife’s generation when they tell me they won’t behave like today’s ajumas. Power corrupts. Ajuma power corrupts absolutely. 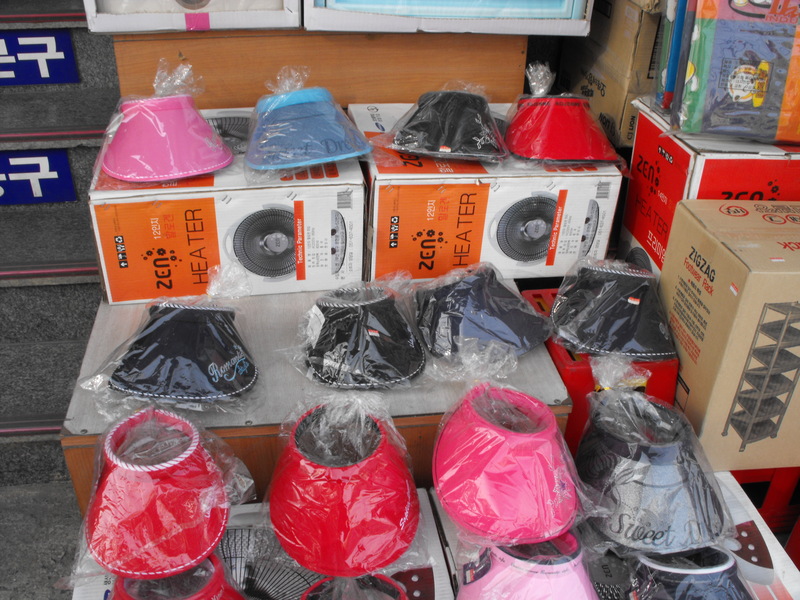 Ajuma visors come in many colors - but all black is best for intimidating the young. I had a couple of ajumas budge in front of me in a lineup in Korea and I was in the ajuma age group. I guess I probably needed one of those visors! Good lord. The funny thing is that I’ve seen pictures referencing Ajumas before – I just didn’t “get it”. I just about peed my pants because of an Ajuma.